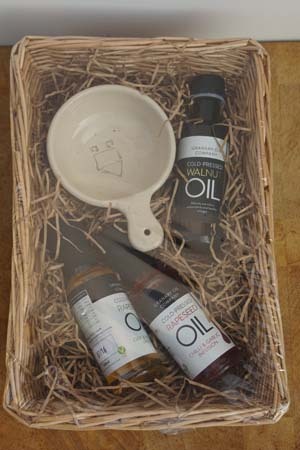 Welcome to Granary Oils the home of our fantastic Cold Pressed Walnut & Rapeseed Oils which includes flavoured Rapeseed Oils and a range of skin care products made using our oils. Walnut Oil is often described as a super food and is packed full of health benefits and best used cold. See the Walnut Oil page for more information. Granary Oils cold pressed Rapeseed Oil has a gentle nutty flavour giving you a healthy, tasty and versatile oil for all your culinary needs. We are at many of the local shows, Farmer’s Markets, Food Festivals and other local events and you can also buy our oils online from our By Now, from the door or from independent shops around the Shipston-on-Stour area. Check out the News page for details of forthcoming events. New batch of walnut oil available now,available at Deddington Farmers Market tomorrow morning.